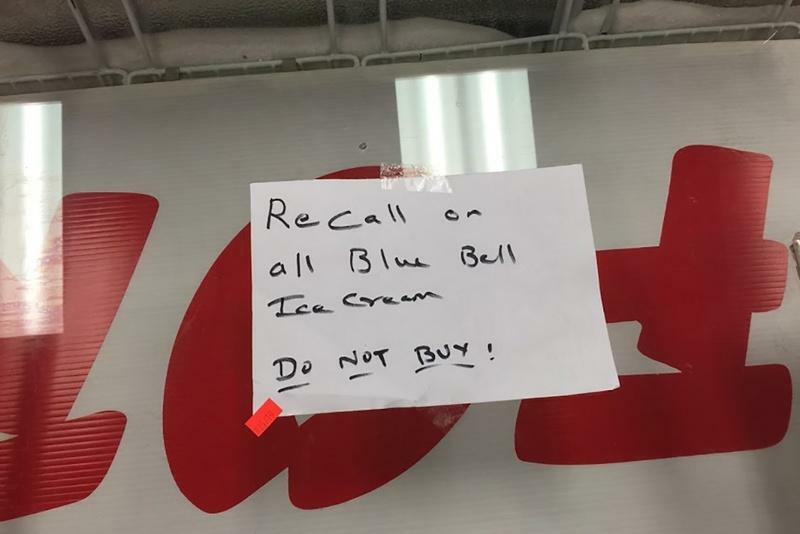 A sign on an ice cream case in an Austin convenience store warns shoppers of the Blue Bell recall. It’s the phone call no company in Texas wants to receive. Shortly after lab tests on two Blue Bell ice cream flavors — Mint Chocolate Chip and Chocolate Chip Cookie Dough — came back “presumptive positive” for the deadly bacteria Listeria monocytogenes , Kathy Perkins reached for the phone and contacted the Brenham-based company with the unfavorable news. As the assistant commissioner of regulatory services for the Texas Department of State Health Services, Perkins wasn't demanding that Blue Bell take any specific action. She was delivering the kind of gentle but powerful nudge her agency makes in times of foodborne disease outbreak, not knowing whether the partial test result would be enough to prod a corporate powerhouse like Blue Bell into action. “Usually food manufacturers work with us,” explained Carrie Williams, a spokeswoman for the Texas health agency. There were no guarantees Blue Bell, which has grown from the little creamery in Brenham to a frozen dessert powerhouse during its 108-year history, would see the “presumptive positive” — a kind of maybe from the state lab — as a sign to act. “A presumptive positive means we are going to pick up the phone and have that conversation," she said. For years, Blue Bell’s track record with the state health department, which licenses the company as an in-state frozen dessert manufacturer, has been a decent one. Each month the state inspects the company’s two plants in Brenham. “Over the years, Blue Bell has had a good inspection record and very few issues, and none that required a warning letter or penalty,” Williams said. But despite its homespun image, Blue Bell is no small village operation. As the nation's third-largest maker of ice cream, it has captured some 6.4 percent of that market, trucking gallons of the beloved Texas frozen dessert from four manufacturing plants (two in Texas, one in Oklahoma and one in Alabama) to 62 distribution areas in the country. As of last year, Blue Bell was on its way to clock nearly $1 billion in annual sales. If food companies don't act when faced with contamination issues, the Texas agency can bring down the hammer. In 2010, it ordered the mandatory recall and shutdown of San Antonio-based Sangar Fresh Cut Produce after state lab tests of chopped celery indicated the presence of Listeria. In 2009, the agency ordered the shutdown of a Plainview peanut processing plant after Salmonella was detected. When Perkins makes such a fateful call after a food product tests positive for bacteria, the hope is a food manufacturer will work quickly — on its own — to protect the public’s health. Because if it doesn't, the agency could be forced to order a mandatory recall or, as it has in the past, shut down an entire company. “It’s in their best interest to work with us,” Williams said. In this case, Blue Bell took the state’s hint on Monday and then some. After hearing from Perkins and taking a look at their own sample tested at a private lab, Blue Bell officials pulled the trigger and ordered a voluntary recall of every Blue Bell product on grocers’ shelves. That’s 8 million gallons of ice cream product being recalled this week. The company’s corporate sales force, part of the 3,800 Blue Bell workforce, hit the computers and phones, sending out the news to its distributors, mainly grocery and convenience stores, to pull every carton of its product from the shelves. By Wednesday, the beloved Texas brand that has been a proud state tradition since 1908 was gone from most store shelves. “I think the fact they did a full recall from the marketplace speaks volumes about how seriously the company took the results,” Williams said. The crisis for Blue Bell began on March 13, when Kansas officials determined that Listeria-tainted portions of the company’s ice cream made it into products served to five hospital patients between January 2014 and January 2015. Of the five who became ill, three died. By March 24, Kansas officials traced the source of the listeria to Blue Bell’s plant in Broken Arrow, Okla., built by the Texas company in 1992. On April 3, the Centers for Disease Control had traced Blue Bell’s Listeria strain to six other patients going back to 2010. Four had been hospitalized in Texas for unrelated problems when they became sick from listeria. Five days later, on April 8, the CDC had identified two clusters of Blue Bell listeria victims. The strains were traced to the plants in Oklahoma and Texas. 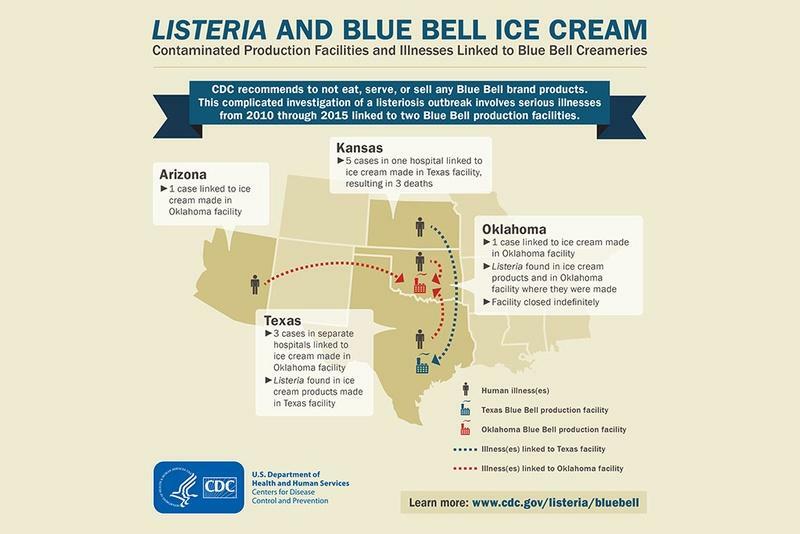 A breakdown of the listeria outbreak from Blue Bell ice cream. On Tuesday, 10 people in four states — Texas, Arizona, Oklahoma and Kansas — had been confirmed as having been made sick by Listeria-infected Blue Bell products. Because it can take Listeria, a life-threatening infection, up to 70 days for symptoms to appear, it’s a tough disease for health officials to trace because few of us can recall what we’ve consumed over that length of time. On Thursday, Blue Bell spokesman Joe Robertson said there was little hesitation in deciding to recall all products. He said the company has been touched by the outpouring of support from Brenham and elsewhere. As for the impact on tiny Brenham, where Blue Bell is the largest employer, Robertson said every employee is needed right now.